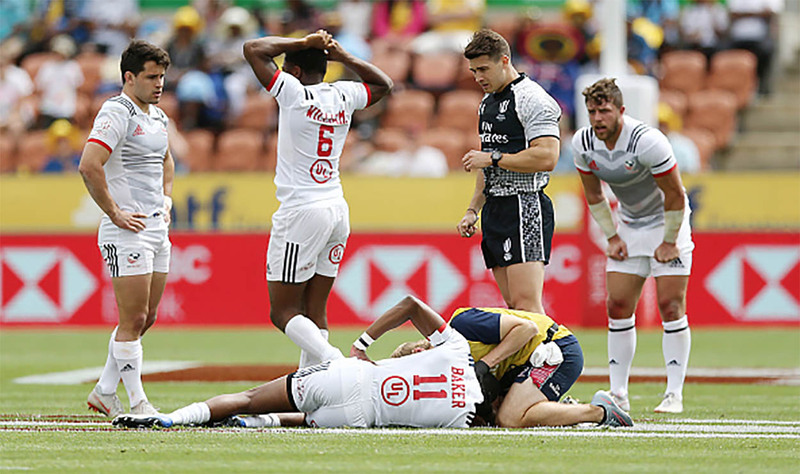 Rugby Sevens starlet Perry Baker will undergo surgery after a collision with Tonga’s Tana Fotofili in the opening game at the HSBC World Rugby Sevens series in Hamilton. The American was left with a double fracture of his jaw which is expected to keep him out until early April. His absence means the USA will be without one of their talisman for the next two legs of the Series events in Sydney this weekend and Las Vegas next month where the USA are the defending champions. Mike Friday, the USA coach, insists the team will not rush Baker during his recovery. “It was unfortunate for Perry and it was a tough tackle, legal but maybe reckless and the outcome is that Perry’s jaw was fractured in two places so he has returned home and will have surgery. We will then look at his recovery and there is an outside chance he could be ready for Hong Kong but we won’t push it. Baker arrived back in the USA yesterday to see a surgeon as he looks to recuperate in time for the Hong Kong Sevens which start on April 5. The two-time World Rugby Sevens Player of the Year passed a head injury assessment after the heavy hit in Hamilton. However, x-rays later revealed the broken jaw which forced the USA into sending him home to see a specialist. The incident will add fuel to the on-going issue over protection for players in both sevens and the 15 man game with Fotofili only receiving a yellow card for his actions. The USA reached the final of the Hamilton leg in spite of Bakers injury and were beaten by Fiji who have joined the Eagles at the top of the table heading to Sydney. Both teams have 57 points with New Zealand three behind. 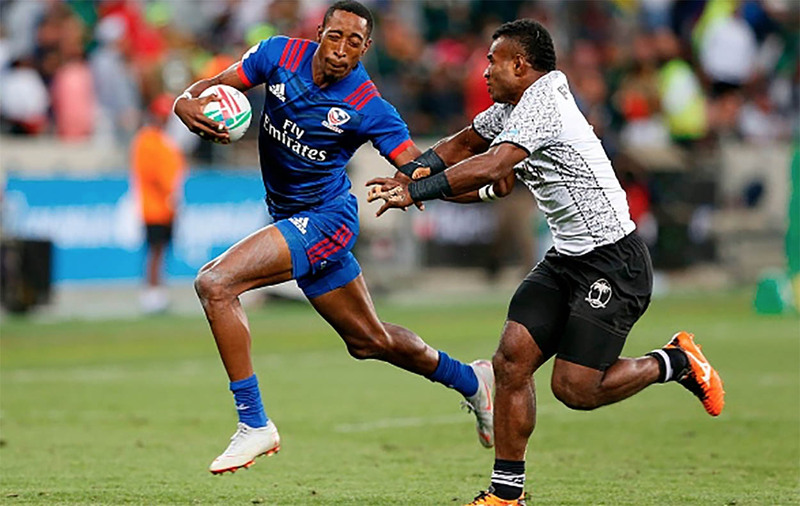 On January 26th, the next round of the Sevens World Series will commence at the FMG Stadium Waikato in Hamilton, New Zealand. It is just the second time the 23,600-capacity stadium has hosted the event, after the venue of the New Zealand round was moved from Wellington in 2018. After the first two rounds in Dubai and Cape Town, USA top the standings; one point clear of hosts New Zealand and 3 points ahead of Fiji. England are hanging onto the coattails of the leaders, 8 points adrift of the top. With 16 teams contesting in 45 matches across just two days, here is a quick preview of each pool. Fiji will be without key men Vatemo Ravouvou and Amenoni Nasilasila after the FRU confirmed they will not be involved in the Hamilton or Sydney legs of the competition, amid off-the-field disciplinary issues. Despite this, Fiji will be looking to replicate their win in Hamilton one year ago, and bolster their position at the top of the standings. Australia are perhaps the best equipped side to challenge Fiji for top spot in Pool A, with speedster John Porch starring yet again this series. His total of 98 points puts him at the top individual standings, 13 points clear of his nearest challenger. Argentina, who won the Challenge Trophy in Cape Town with a resounding win over Samoa, may be the dark horses of this particular group. The South American side stunned South Africa in Dubai to reach the quarter-finals, and will be hoping to reach the Cup competition for the second time this series. Wales make up Pool A, and have included 3 uncapped players in their playing squad, as they look to improve on a disappointing 14h place finish last time out in South Africa. Current series leaders USA will be the team to beat in Pool B, as ‘The Eagles’ look to secure some silverware, following two cup final losses. Head coach Mike Friday told USA Rugby; “We need to stay focused, show humility and work hard on our own game individually and collectively as we lost two finals due to mistakes which were more than avoidable”. England will meet USA in their final pool match, in a repeat of the Cape Town quarter-final that saw the latter progress in a hard-fought 19-12 victory. Should England progress from Pool B into the Cup competition, they will be guaranteed to face a team lower than them in the current standings. With this in mind, a 4th place finish is well within reach, especially if England want to challenge for the series title this season. South Africa are undoubtedly the favourites for Pool C, and will be boosted by the return of the experienced Chris Dry. Dry has made over 300 appearances for the sevens side, but has missed over a year of rugby with a knee injury. The ‘Blitzboks’ will hope Dry can help them build on a third-placed finish last round. A much-improved Scotland side have reached the semi-finals in both of the previous tournaments, and will more than likely be competing with France for the second Cup spot in the pool. France are yet to reach the Cup quarter-finals this year. However, Kenya head coach Paul Murunga is optimistic his side can make an impact on the tournament, despite their recent troubles. A contractual row between the KRU and senior squad members has meant Murunga has been forced to rely on young, inexperienced players. “We have already exposed five rookies in the first two legs and hopefully, we shall have more coming in to ensure there is adequate competition for places,” Murunga said. “In Sevens it is possible to beat any team. It all depends on your level of preparedness,” he said. Hosts New Zealand have a number of players returning from unavailability, with Tim Mikkelson back in the squad after the birth of his first child, and Joe Ravouvou part of the ‘All Blacks’ setup for the first time since gaining New Zealand citizenship. In front of a home crowd, they will be aiming for nothing less a win, and to overhaul USA at the top of the standings. Spain will provide New Zealand with a worthy challenge in Pool D, and the home nation will have to keep a close eye on talisman Francisco Hernandez. Hernandez has racked up 63 points so far this campaign; a notable achievement in a largely inconsistent Spanish side. Japan and Canada make up the pool, who are two sides that still have much to prove on the world stage. The last time these two sides met in Dubai, Canada ran out 27-7 winners in an assured display. How does he make it look this easy? 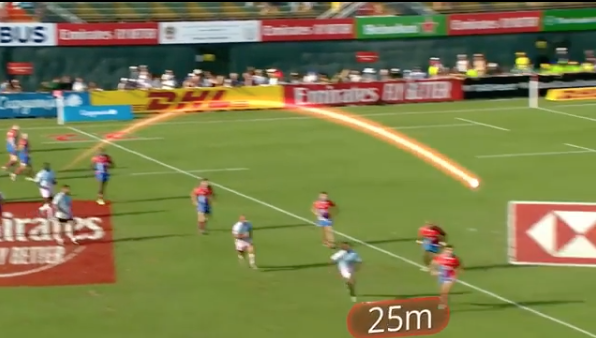 We reckon this won’t be the last time we’re writing about some ridiculous stuff in this years World Sevens circuit but it wasn’t long until Bobo gave us this gem.
? Sireli Bobo just launched one of the biggest passes we’ve ever seen at a Dubai invitational match.